One of the details we advise paying closest attention to? Cabinet hardware. Ahead, we’ll take a look at the types of cabinet hardware available. And while we will talk a bit about knobs and pulls, we’ll mostly be focusing on the cabinet hardware that actually works for you— that maximizes space, minimizes noise, and most importantly, makes your life easier. Knobs, pulls, runners, guides, hinges — What cabinet hardware are you in need of? Whether you’re building a brand-new kitchen or updating a family room with built-in storage, cabinet hardware should be high on your design to-do list. It’s one of the final steps in finishing your dream space, but it's also one of the most important. Below, we’ll go over the key hardware choices you’ll need to make as you plan and design your new cabinets. Naturally, knobs and pulls are the most traditional types of hardware for opening cabinets. But if you prefer the minimalist look and are interested in cabinets without pull or knob hardware, you have a few options. First, there are integrated handles. Effectively, these are cabinets with a beveled cut at the open edge of the drawer or door. This allows the homeowner to easily open and close cabinets with their fingertips. Your second option is called a hidden pull. While these are slightly visible, they are much more discreet than traditional, two-screw pulls that go right in the middle of a drawer or on the edge of a cabinet door. Instead, hidden pulls are small, inconspicuous pulls, generally affixed at the very top of a below-the-counter cabinet door or drawer. Lastly, you have what’s actually a type of latch called a push latch, but we’ve put it here because it replaces the need for knob or pull hardware. At Plain & Fancy, we utilize state-of-the-art TIP-ON push latch technology by Blum. TIP-ON helps you open handleless cabinets with the greatest of ease — just one touch and the drawer, door, or lift system opens right up. The push latches are magnetic and mounted inside the cabinet. TIP-ON technology can be used anywhere: In frameless or face frame cabinets and inset and overlay applications. When you press lightly on a cabinet door or drawer with a push latch, it springs in and opens in one fluid movement. TIP-ON technology by Blum is the leading push latch technology in the industry. These hardware features keep your cabinetry closed. 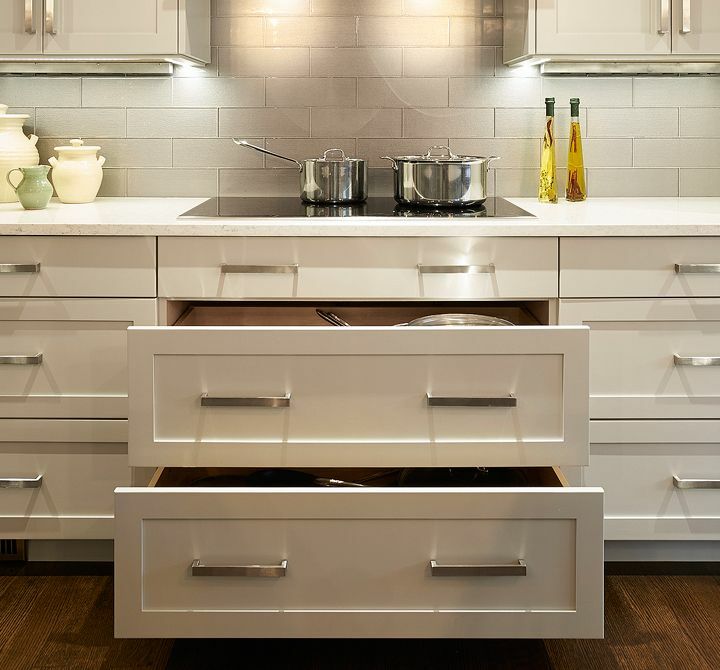 Hinges are featured on every type of cabinetry we furnish here at Plain & Fancy. These movable joints link cabinet doors to the frame of the cabinetry. There are two types of hinges to choose from. The first are barrel hinges, which require a magnetic catch. While these hinges work wonderfully, they’re quite loud. And if you think of how many times you open and shut your cabinets in a day, you can probably feel the headache coming on already! Instead of enduring daily headaches, we recommend soft-close technology hinges — the second type of cabinetry hinges available and by far, the most popular. These make slamming doors shut a thing of the past. Soft-close hinges are ultra-discreet and create a silent, fluid movement when you shut drawers or doors — no matter the door size or weight. This means that drawers and doors shut with almost no sound, even if you close them quickly or with excess force or if you use no force and just let them drop back into place. At Plain & Fancy, we use only the best soft-close technology hinges from Blum: BLUMOTION. BLUMOTION technology can be used on any type of cabinets, and we recommend it in tandem with Blum’s TIP-ON technology for the smoothest operating cabinets imaginable. Finally, latches are the least typical type of this hardware to be found. Generally speaking, cabinet door latches are only for families with children or pets, who want to ensure that cabinets stay firmly shut. 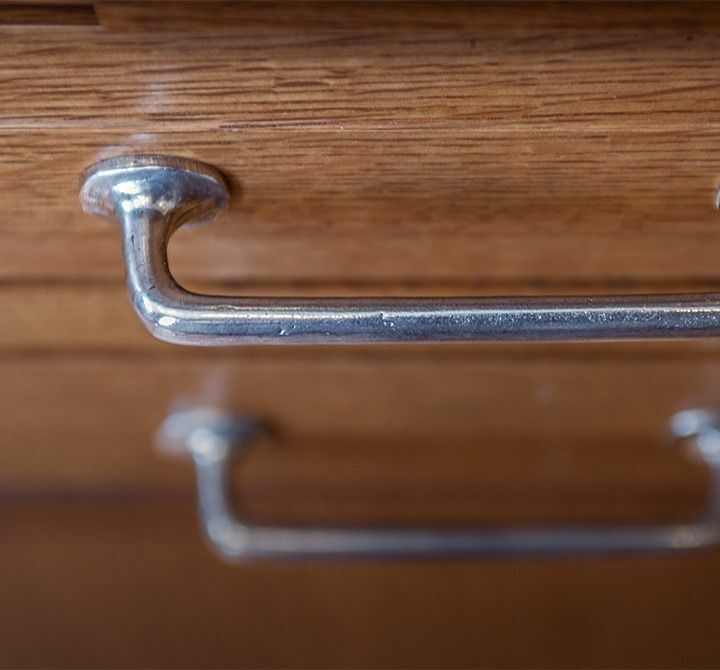 Now that we’ve gone over hardware for opening and closing your cabinets, let’s take a look at the hardware you need for operating your cabinet drawers. There’s a lot more going on back there than you may think! Let’s begin with full-extension drawer runners. Drawer runners are the hardware devices that cradle each drawer on either side and provide for fluid opening and closing motions. While basically every drawer has metal-framed drawer runners these days (old-fashioned drawers were simply set inside the internal framework of the cabinet), the best and most modern drawers feature full-extension runners, and ideally, TANDEM full extension drawer runners by Blum. 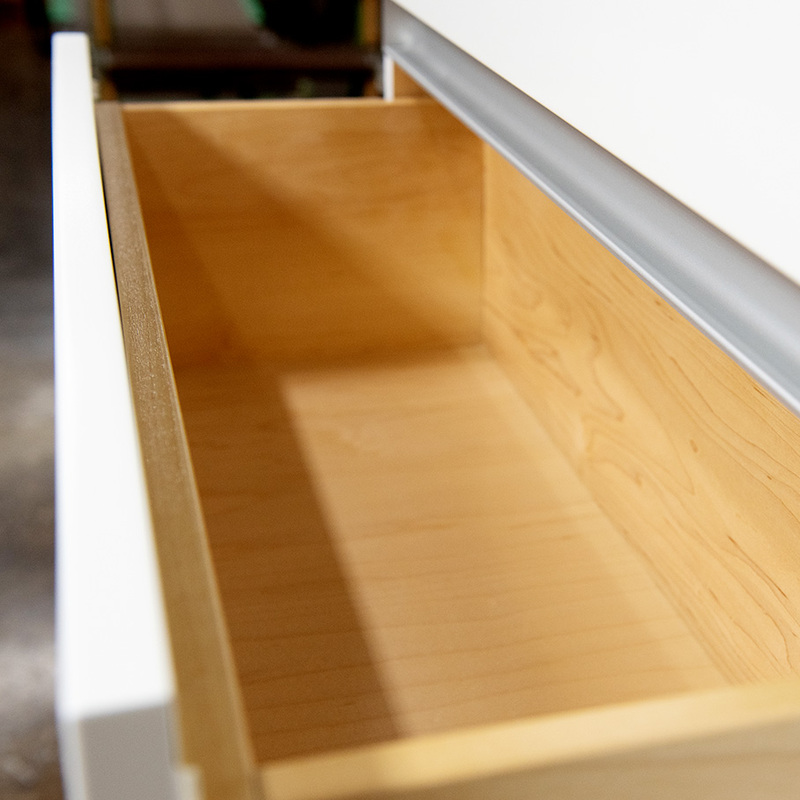 The full-extension feature on TANDEM drawers allows you access to the very furthest reaches of your drawers. When used with soft-close BLUMOTION technology, you also make opening and shutting drawers a silent affair. With TANDEM, these features are fully concealed, so your sleek kitchen design won't be ruined by the appearance of metal guides. And lastly, we have lift systems. A common feature on European cabinets, lift systems literally lift your upper cabinet doors up and out of the way. Why is up better than to the side, as with traditional upper cabinet doors? Well, it’s not always better, but we recommend the lift system feature in combination with traditional doors. This allows for a more fluid kitchen configuration that will make cooking and cleanup much easier. When you have a lot of people in your space, cooking, cleaning up, chatting, and standing around, opening and shutting door after door can be a complicated dance. And we’ve all probably whacked our heads on an open door more times than we’d like to count. With a lift system, however, lift doors stay open wherever you put them. This makes it amazingly easy to access everything in your upper cabinets without opening doors into others’ space. With help from TIP-ON technology, cabinet doors can be opened with a simple touch, or another nice feature is that some lift-up doors can even be opened by remote. Plain & Fancy Custom Cabinetry creates completely customized cabinetry for kitchens of any size or style. For over half a century, our cabinets have been made right here in the United States with real Pennsylvania Dutch craftsmanship. Family owned and operated, we proudly put our name on every piece of cabinetry that leaves our facility because we know it’s been painstakingly crafted out of the highest-quality materials by the finest craftsmen and state-of-the-art equipment. Like each cabinet we construct, Plain & Fancy only uses hardware that is built to last. Not sure what type of hardware you need? Talk to one of our designers who would be happy to listen to the goals you have for your space and come up with some ideas to spark your imagination. In the end, we’re only happy when you’re happy. Contact us today to speak to a dealer or designer or to find a showroom near you.